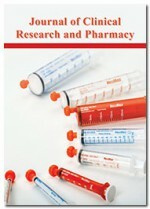 Journal of clinical research and pharmacy is a multidisciplinary, peer reviewed periodical that focuses on the dispersal of knowledge regarding recent research developments in the field of clinical research and pharmacy journal serves scientific information, studies, and scientific outcomes of various international pharmaceutical & scientific industries, institutes and forums. Journal of clinical research and pharmacy has been designed to cover all the fields of research, which has any correlation and impact on clinical research and pharmacy. Clinical research in the department of clinical pharmacy tends seeks to determine the safest and most effective use of medications for a given patient or population and disease state, while accounting for age, gender, ethnicity, health status and genetics. Journal of clinical research and pharmacy publishes manuscripts on Clinical data management, Clinical pharmacology, Clinical trials, Clinical research ethics, Good clinical practice, Nursing research, Placebo researches, Drug discovery, Meta-analysis, empirical research, Pharmaco-informatics and radiopharmaceuticals. Clinical research and pharmacy is a peer-reviewed, open access journal designed for the wide dissemination of research in the field of medicine to worldwide audience. The main aim of the journal is to develop a standard of excellence in basic and translational research that improves human health and disease in the community and globally. It promotes and fosters research directed toward clinical research and pharmacy of international interests. The periodical accepts manuscripts in the form of original research articles, review articles, case reports, case series, mini review, rapid communication, letter to the editor and editorial for the publication in an open access platform. All the articles published in the journal can be accessed online without any subscription charges and will receive the benefit of extensive worldwide visibility. Review Process and Tracking. The Journal is using Editorial Manager System for easy online tracking and managing of the manuscript processing. Each article undergoes a peer review process under the supervision of an assigned Editor. To be acceptable for publication, an article should be positively considered by two individual reviewers followed by the Editor’s consent. All the Submitted articles are subjected to peer review process prior to its publication to maintain the quality and the significance of the journal. The published articles are made freely and permanently accessible online immediately upon publication. This improves the citations for authors, useful in attaining impressive impact factor. All Submissions (Only Research Article) on or before December 18, 2018 would not be subjected to processing charges. Journal of clinical research and pharmacy welcomes submissions via Online Submission System http://www.editorialmanager.com/alliedjournals/default.aspx or via email to the Editorial Office at [email protected].